Does A Watched Market Ever Top? Too many investors are expecting a stock market top right now. This healthy skepticism actually prevents a top from being made. Low earnings expectations will also fuel the bull this spring. We've all heard the saying, "A watched pot never boils." Not many realize, however, that this bromide can also apply to the stock market. For when everyone is waiting for the market to top, the top never comes. Seemingly, everyone is looking for stocks to peak out during the latest earnings season. In today's report, I'll argue that this vigilance on the part of investors will, ironically, prevent a major top from being made anytime soon. There was a time when investors would be pouring into the market after a performance like the one we've seen so far this year. Normally, rising prices attract big crowds, but these aren't normal times. Instead of clamoring to get into the market at any cost, many seem to be looking for excuses to not own stocks. As sentiment polls have shown in recent weeks, investors are still apprehensive about owning equities, and many expect a top will soon be made. This widespread nervous condition among market watchers has prevailed all year and is a carryover from last year's plunge in the major averages. Admittedly, investors are beginning to shed some of their fears over the fragile state of the global economy. Yet, the latest sentiment polls show that uncertainty is still fairly prevalent. Consider, for instance, the latest results from the weekly survey by the American Association of Individual Investors (AAII). Last week's poll revealed that the percentage of bulls increased to 40%, a 5% increase from the week before, while the bears fell 8% to a mere 20%. Stock market skeptics were quick to point out that the percentage of AAII bears was at a level historically associated with major market tops. What they conveniently ignored, however, was that most major peaks occur when the AAII bulls are at 50% or above. At current levels, the percentage of bulls can still increase even more before the sentiment data legitimately supports a major top. Below is a graph which illustrates the extent to which bullish sentiment among individual investors has tended to rise immediately prior to a market top. As you can see here, the AAII bulls have gone well above 40% each time a top was in the making. 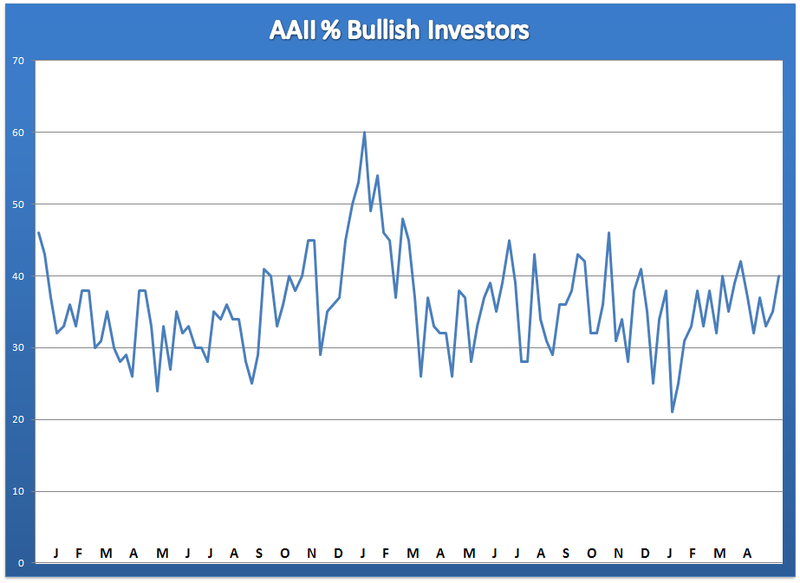 In the year to date, the AAII bulls have only gone as high as 42%. That leaves plenty more room for stocks to run higher before sentiment becomes ebullient, and the market is in danger of overheating. Another widely followed sentiment poll is the Investors Intelligence bull/bear ratio. Sentiment as tracked by Investors Intelligence shows that, as of last week, the bull/bear ratio was 2.81. That's still below the levels normally seen at a major market high. Historically, this bull/bear ratio will exceed the 3.0 level (see chart below) when stocks are in the process of overheating and just prior to a significant market decline. This isn't yet the case. Moreover, analysts seem to be ignoring the above-normal percentage of neutral investors. Last week, the "neutrals" in the AAII poll were almost 40%. That's still far too many fence-sitters to support a market top of intermediate-term (3-9 month) proportions. For example, the January 2018 intermediate-term top in the S&P 500 Index (SPX) was preceded by a 54% bullish reading in the AAII poll on Jan. 18. The percentage of AAII neutral investors that same week was only 24%. 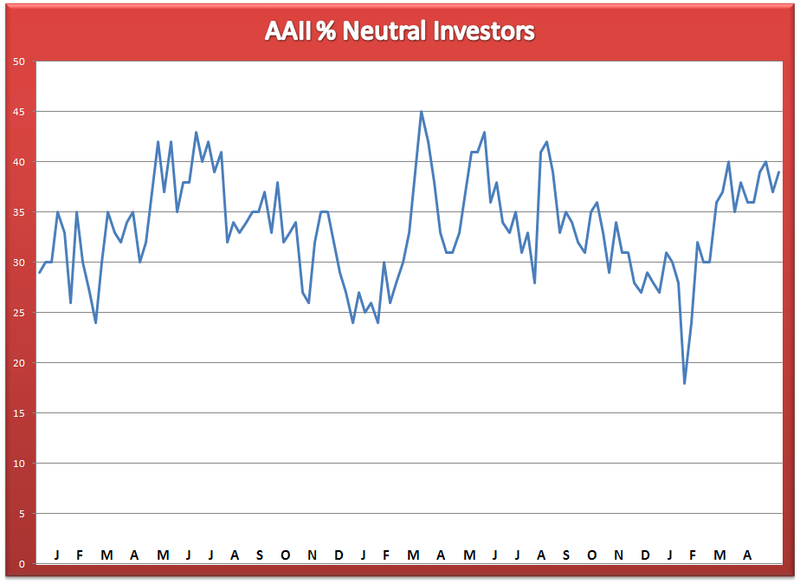 In the first week of October, just before the SPX broke down, the percentage of AAII neutrals was only 29%. The above examples are good examples of what we should be seeing if the market is truly in the process of topping. What we're seeing now, though, is a fairly high percentage of neutral investors. This suggests that a healthy degree of skepticism still exists toward equities, and this in turn will strengthen the bull market's "wall of worry" by allowing stock prices to climb higher during earnings season. On the earnings front, the low expectations set by Wall Street analysts heading into the latest reporting season have made it easy for companies to exceed expectations. With just 6% of S&P 500 companies reporting Q1 earnings so far, 83% of those companies reported a positive earnings per share (EPS) surprise, according to FactSet. Meanwhile, 59% of S&P 500 companies have reported a positive revenue surprise. If this is any indication, we should see a lot more earnings beats in the coming weeks with stocks across several major industry groups benefiting from this. Short positions recently initiated by traders anticipating a market top will only help fuel these rallies. Although investors aren't nearly as skittish now over the financial market outlook as they were last month, there's still a degree of uncertainty over the intermediate-term outlook. The sentiment data reviewed here suggest that a large percentage of investors aren't committed to equities right now. This implies there's still plenty of cash on the sidelines that can be allocated to stocks in the coming weeks, especially if positive earnings surprises continue to attract attention to overlooked companies. In view of this, investors are still justified in maintaining a bullish stance toward equities. On a strategic note, traders can maintain a long position in my favorite market-tracking ETF, the Invesco S&P 500 Quality ETF (SPHQ). I suggest raising the stop-loss to slightly under the $31.40 level for this ETF trading position on an intraday basis. Only if this level is violated, will I move to a cash position in my short-term trading portfolio. Meanwhile, investors can maintain longer-term positions in fundamental sound stocks in the top-performing real estate, consumer staples, and healthcare sectors.